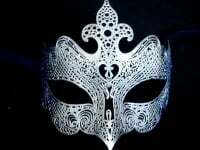 A beautiful classic design with a contemporary update, this shimmering Black Megan Filigree Mask is perfect for adding a cutting edge to both your party and masked ball outfit. 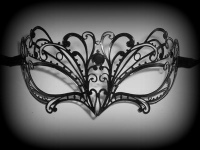 Designed in delicate filigree lace metal with glittery Swarovski Crystals. 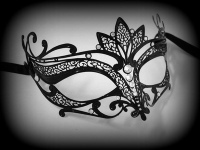 Exuding pure elegance with a modern fashionable twist, this must-have party mask will look fabulous worn with silver or gold jewellery & a little black dress, guaranteed to make you storm ahead of the latest fashion trends.